NEW YORK – The best player in baseball happens to play for a team that resides in Orange County, Calif., home to some of the best beaches in the country, a hockey team that’s two wins from a trip to the Stanley Cup Finals, Disneyland, and near-perfect weather 365 days a year. The same team, the Los Angeles Angels (of Anaheim? ), had the day off on Thursday. Most of them spent that day exploring the biggest and busiest city in the country as the Angels were set to begin a three-game series at Citi Field against the New York Mets on Friday. Mike Trout, the unquestioned best player in baseball, didn’t spend the day in Newport Beach or the night at the Ducks’ playoff game or taking in a Broadway show in New York, either. Trout, of course, flew home and spent a rare, in-season day off on the East Coast back home, in Millville, N.J. The truth is Trout spends half a year back home. Unlike, say, Kobe Bryant, he didn’t begin a professional career in Southern California and leave the Philadelphia area behind for good. He lives in Millville in the offseason (and also visits in the summer when time and travel allows), he goes to Eagles games at Lincoln Financial Field in the fall, and he goes on hunting trips with Carson Wentz during his free time. And then each spring he moves back West and calls California his home base on an annual summer tour of annihilating baseballs and drawing comparisons to the best to ever play the game. Seven weeks into the 2017 season, the 25-year-old Trout is in the top four in the American League in every Triple Crown stat (.341, 4th; 13 home runs, 2nd; 30 RBI, 3rd), trails only Freddie Freeman and Bryce Harper among MLB players in OPS (1.193), leads all players in most relevant advanced statistics, including WAR (2.8), OPS+ (226), and Win Probability Added (3.2). Each five-year period begins with the player's first full big league season. In Mays' case, we began in 1954, after spending the '53 season in the military and because he was limited to 34 games in '52. Trout, the youngest player in MLB history to reach 150 career home runs and 150 stolen bases, entered Friday having hit a home run in six of his last nine games. Arriving in New York less than a week after Derek Jeter had his number retired in the Bronx, Trout was told many believe he should succeed the former Yankees captain as the unofficial face of baseball. Mike Trout begins his media tour on Friday afternoon in the visiting dugout at Citi Field in New York. "Cameron Maybin and I were talking on the bench about how easy baseball was when we were in high school. That’s how it is to him in the big leagues." But for all of Trout’s historical talent and jaw-dropping athleticism, he’s the furthest thing from a self-promoter. He won’t be flipping his bat after a home run let alone begin campaigning to be an ambassador of the game. 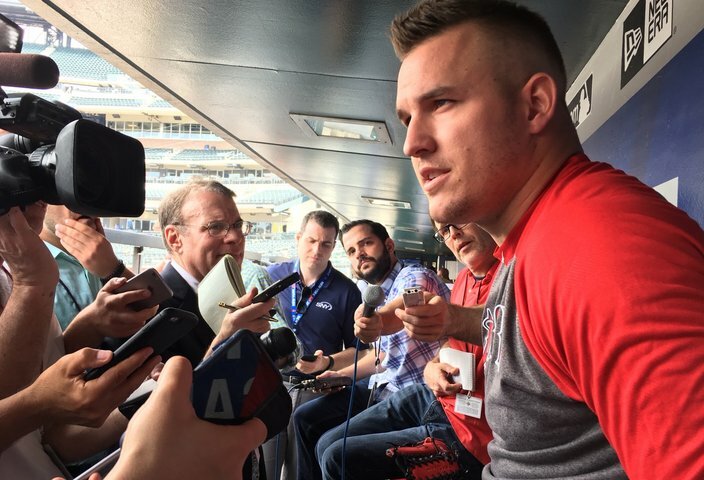 After he was run through the obstacle course that is the New York media circuit on Friday afternoon, Trout took a few minutes outside the visiting clubhouse at Citi Field for The Q&A. Who is your favorite all-time Philadelphia athlete? Mike Trout: Favorite Philadelphia athlete of all time? Man. That’s a tough one. All-time favorite Philadelphia athlete ... I was a big (Allen) Iverson fan. A big (Brian) Dawkins fan. I like Dawkins. First jersey you ever bought? The most recent one you bought? Probably Wentz or Zach Ertz. How did you and Carson Wentz become hunting buddies? We just contacted each other. He knew I hunted and I knew he hunted, I knew he lived close. So we just met up. Do you guys keep in contact? We text each other. And obviously Zach Ertz, I’m a big fan, a big fan of the Eagles. So outside of baseball, we keep in contact. As an Eagles fan, how do you keep the faith? You know, they’re making good moves. And, as a fan, you always want them to improve. How about with the Sixers – do you trust the process? Oh yeah. I like the way they’re going. I was a big Sixers fan growing up and still am. With all of the picks they’ve got coming, they should be headed in the right direction. You were in the parking lot outside Citizens Bank Park celebrating with friends with the Phillies won the World Series in ’08. Whose jersey were you wearing then? Yeah, I was (there) … I was wearing Phillies gear but I don’t know what kind of jersey. I can’t remember what jersey I was wearing. Do you manage to keep up with the Phillies at all still or is your schedule just not very conducive to that since you have a job to get ready for each night? Yeah, with Howie Kendrick on the team I’ll look up and see how he’s doing. But that’s about it. With all due respect to the Angels and being under contract for 3 1/2 more years – but you also are only 25 – do you ever envision a time when you think you could see yourself playing in Philadelphia? Uh, you know, I love Anaheim. I haven’t even thought about it. Your favorite Philadelphia cheesesteak place? See, I like Jim’s Lunch (in Millville) but that’s not in Philly. Pat’s or Geno’s, I like both of them. I’m a big Sea Isle City fan. [Laughs.] All the time. I see it all the time. At least once a day, that’s for sure. Everybody knows you’re big into hunting a fishing. What else do you do with free time, like on the plane during road trips all summer? Playing cards. I like to golf. I spend time with my fiancé and my family. I remember your dad telling me back when the Phillies traded for Roy Halladay (in December of 2009, six months after he was drafted by the Angels) that you texted or called him and said, "We got Halladay.” Is that true? Yeah, probably. I was pretty excited, that’s for sure. Is it tough being a Philadelphia sports fan all the way out in Southern California? It’s always tough when you’re on the West Coast and you don’t see the teams as much, but I’m still a big Eagles and Flyers fan. And Sixers, too.